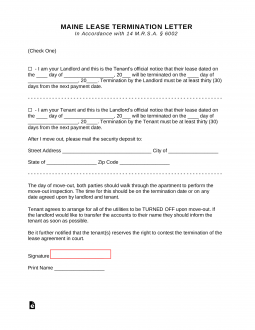 The Maine Termination Lease Letter Form will satisfy this state’s requirements for terminating an at-will tenancy. It may be used for other types of leases but would require additional proof that such an action is allowed under the special exceptions made by the State Legislature of Maine. In such rare cases, it is highly recommended to seek the advice of an attorney before attempting to do so. However, if one has a month-to-month residential agreement, this form letter will do nicely provided it is used properly. There is one important factor for the landlord issuing this notice to be aware of and two for the tenant. For the landlord, this notice of termination must be in the tenant’s hands a full thirty days before the termination date listed. This will give the tenant enough time to find a new residence. Similarly, a tenant issuing such a notice must also make sure the landlord receives it a full thirty days before the termination date as well. An additional consideration for the tenant concerns his/her security deposit. The tenant must report a reliable mailing address where the landlord may send his/her security deposit. Naturally, this will be less any money that would be necessary to cover any damages caused by the tenant. In this case, the landlord will need the address to provide an explanation for any amount that is missing. It should be noted that in order for a landlord to be held fully responsible for returning the security deposit in a timely fashion, this address must be provided. Step 1 – Check the first box then enter the date of the lease, as noted on the lease, and the date of the desired termination. Step 1 – Check the second box, then enter the date of the lease, as noted on the lease, and the date of the desired termination. Step 2 – Enter the mailing address of where you wish the landlord to send your deposit or any notices regarding the security deposit. Step 3 – Sign and print your name at the bottom of the page.